The partial discharge test set TPP will be used for non - destructive insulation and quality tests of electrical components according to IEC 664-1 and EN 50178. The partial discharge test set offers tests in the development, fabrication, and in quality assurance. It consists of three units. Partial discharge meter TMG, with integrated measurement of RMS - voltage and peak voltage. Screened and partial discharge free high - voltage unit 5 - 20kV. Control unit with electronic over current protection. Knowing the level and number of PD-pulses in relation to the phase position is important to find out the causes of failures, especially during development and testing of complex components. The software EAPS allows to detect, display and analyze partial discharges, which will be displayed with number, level and phase position. Following graphical displays are available. Besides simple operation you have the advantage of adjusting any angle of view of the three-dimension chart. Of course it is possible its load, save and export graphics. Last but not lease each operate can save its own setting. MPS also offers the possibility to realize special clientele demands. A complete remote control of the partial discharge test set TPP is possible with software MSPS. It is designed on a database and offers following possibilities especially for series fabrication tests and in the quality management. Automated control of the PD-test and recording of measured values with the indication pass - fail break down. Simple operation, only pressing the start button. Easy edition of the test parameters for the test sequences. Several successive test sequences are possible in one test plan. Combination of dielectric and partial discharge test. Additional test sequences for DC - test, current resistance resistance and capacitance measurement (option). Test report with all measured values and setting parameters. Automatic control of high voltage and measuring selector switch (option). Statistical evaluation with graphical display of test results as a gaussian curve. Log - files for failure diagnostics. Multi user access of one database in connection with several PD - test set (option). Administration of calibration and measuring instrument data (option). Process data recording of the PD - test set (option). The partial discharge meter TMG was developed for testing according to VDE 0434 and IEC 60270. It offers neat grouping and easy use of the operation elements. Narrow band filter with a variable frequency from 0.1 to 2.5MHz. Wide band filter with different ranges (option). 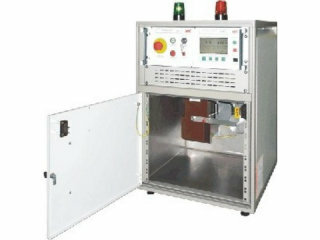 Partial Discharge measuring range from 2.5pC to 25000pC. processed by the use of the analyzing software EAPS. display and an oscilloscope display. Blanking of phase synchronized interferences. Voltage measurement Ù /2 and Urms and frequency measurement (option). Serial interface RS232 standard, or IEEE 488 - interfase (option). Special model for the measurement of the quadratic discharge. RIV - measurement in μV acc. To NAME 107 / Ansi 63.2(option). For determination of the correction factor of the PD test circuit.